Nice power and headroom from 50W receiver, drives efficient speakers incredible with great definition and clarity. Worthy of NAD name with solid construction and heft. Preamp outs are nice bonus. Quite suitable for my 14x19 room. None from my use and application. I've had several appliances Nad both stereo and multichannel, and T743 very best that I've had, the only low noise q I noticed it is the fan used to lower the temperature when used at high volume and heated I recommend it 100%. This is the worst receiver that I have ever owned. I have always had a good opinion of NAD products until I bought this NAD T 743 as a replacement for my old NAD receiver that perished in a house fire. There is a highly audible buzz emitted by the amplifier, at any volume, that is very distressing. Even the cheapest amps that I have ever listened to sound better than this piece of junk. I brought it back to the dealer to have it "repaired" and was told that is the way it was designed and there was nothing they could do about it. Now that the front right channel only works when I thump the receiver up and down several times, I am looking forward to replacing it with a mass market brand that will probably sound much better and cost a lot less. I bought this NAD-743 second hand. Overall I a m very pleased with stereo sound reproduction. Hoever when it comes to DTS, 5:1 (SACD) DTS or even Dolby there is a very annoying tone coming from the cenrter channel -INDEPENDENT- of volume, in other words the sound is there form -68dB all the way to +6 dB at the same intensity,but completely gone at volume at -00. It seems this is a common flaw in this model and corrected in the NAD-743-v2. Too bad for all these T-743 owners like me. Bought used off Ebay a year ago. Excellent sound. Warm and clear with great depth. Sounds like more than 50 watts a channel in Stereo Mode. Makes my Harman Kardon sound cold and without body. Reminds me of some Carver seperates I had years ago. I am using this with some modified B&W CDM 1's. 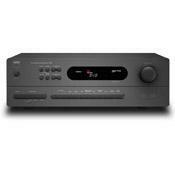 In a small to medium room this reciever has plenty of power unless you are really into SPL's. All the functions work well and is easy to set up. Unit does not run as hot as most of the recievers I have had. Over all hard to beat. I believe this reciever won product of the year several years ago when it came out. I can see why. If you can get a good deal on a used one you will be very pleased. 4 COAX INPUTS (less finicky than optical and works for PS/2, CableTv etc) where as most other receivers only have 2 Coax. Simplicity in that EVERY CONNECTION IS CONFIGURABLE... Text can be changed on display to indicate "PS2" or "TV" or whatever, and inputs can be reassigned as needed ie CD can use DVD as source. Simple interface. SOLID equal power for all 5 channels. No use for >5. Compatible with KAMELEON 8in1 remote (had to download new code). Remote is good but Kameleon 8in1 is better. VCR composite or S-vid can have sync problems for high-signal scenes: ie Spawn anime movie explosions where screen flashes completely white, T743 kicks out "unusable signal" momentarily. It's intuitive and auto configs to best sound for whatever you're watching / listening. Pretty good with respect to composite vid-sync issue but no solution. I feel that a firmware update could correct but it doesn't look like they'll invest the time to correct a bug associated with "old tech". No big deal, as they were responsive and offered several attempts at solutions. I bought this a few months ago along with a Nad DVD player and Wharfedale 5.1 speaker set. I'm very pleased with its performance. The receiver is heavy and seems to be well-built. I have my 37" LCD TV, DVD player, and iPod dock connected to it. The front inputs are great for connecting a camcorder or video game console (such as a PS2). The sound quality is exactly what you'd expect from Nad gear-- amazing. Everything Nad says about this thing is bang on: phenomenal home theater performance without sacrificing musical performance. There's plenty of power available for most users. I live in an apartment building but that hasn't stopped me from pushing the receiver a few times. In addition, the remote is excellent (an area that attracted some criticism in the past) and the receiver has an attractive, clutter-free appearance. The only criticism I have is with the optical inputs. They're spaced so close together that it's difficult to have both connected simultaneously. One cable gets in the other's way making the plugging-in process a little frustrating. (Perhaps I could have shopped around for cables with smaller ends.) Other than that, a great piece of gear that truly exceeded my expectations. Can give you audio bug worse than you may already have it. I haven't been this eager to purchase more products in years! This unit was purchased to replace a Yamaha receiver for a second system in a small to medium sized room. Having to share my residence with a buddy of mine, it is rather difficult to enjoy the main living area of the house when I so choose. I wanted to find the best combination of performance and affordability possible. I truely had no idea what a difference it would make in my room. When first installed, I experimented with Paradigm Atoms in 2 channel only. Let me just say that when you read reviews on NAD products and their overall smoothness, soundstage seperation, and dynamics, BELIEVE IT!! This T743 outperformed my Yamaha by leaps and bounds. I know that's not hard to believe, but when I say that I would rather listen to this entry level NAD over my Adcom GFA5500/Paradigm Studio 100 combo in my living room, take notice. I'm not saying that the Adcom/Paradigm combo is not satisfying, it just lacks the liquid feel of the NAD. I have now hooked Paradigm Studio 20's up to the T743 and needless to say, the improvement over the Atom's is dramatic. The best investment I have made in a very long time. The overall sound with both 2 channel and surround is that of definite quality and is noticable immediately. Fit and finish is a step up also. I rather like the simple appearances of NAD products. Reminds me of military grade equipment. Simple and solid. According to a review on the Soundstage A/V network, the T743 could probably be used to push my Studio 100's in my living room. Yes, I believe that. Although I don't think it would have the same impact as the 200 watts they are being fed right now. I can honestly say that going to a T763 or T773 in my living room is a definite future upgrade. NAD has more refinement than I would have ever expected at the price. Bravo! Can't wait to get my hands on one of their C270 or C272 power amps to connect to the T743 main channels. NO, I really don't need to in my small to medium sized room. However, I am used to being able to push some volume and it would be nice to have the extra security and clean reserves that an external amp would provide. Warm, clean and uncolored sound at a great price. I wish it were physically larger to look more imposing, then they would really never know its "only" 50 x 5! I would call myself an audiophile due to my interest but an enthusiast due to my bank account. Having said that, I believe that the T-743 is probably the best component you can buy IN ITS PRICE RANGE. I would have the T-773 or better yet, NAD separates on my stand but can't afford it. This amp is rated very conservatively at 50 x 5 ALL CHANNELS DRIVEN AT .08% THD WITH 60 DAMPING AT 8 OHMS. (70 x 2 at rated THD in stereo). Dynamic power is 105 x 2 (145 x 2 at a stable 4 ohms) I have compared this power against many other brands touting 100 x 5 or 110 x 5 etc and the NAD clearly outpowered them. Yamaha, Denon, Marantz, Pioneer, etc... it even gives big Rotel receivers an honest run while at the same time sounding warmer. When the speaker load increses, this amp steps up and delivers with no loss at any frequency because of its dynamic power reserves. If you are looking for an under $1000.00(CDN)receiver that will give you warm, clean and powerful sound, this component is not a compromise. Unless you need to drive massive power hungry speakers, you will be impressed. And even then you can use the great processor and add a power amp or two in the future. I have many freinds with other receivers and amps that now believe me when I say ratings on paper don't tell the whole story. They all paid alot more than I did and now they feel dissappointed in their choice.